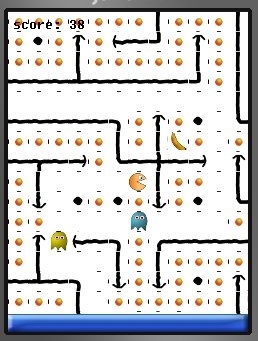 PTR is a 7DRL - an experiment in combining pacman experience and a roguelike gameplay. The available version is for Java-enabled mobile phones, (which excludes Android and iPhone and includes practically all the others). The goal of the game is: earn as much points as possible, escaping the infamous Blinky, Inky, Pinky, Clyde and their twin brothers. Passing Orange - lets you pass through walls. At the beginning of the game you own one piece of fruit of each kind. (The original fruits were supposed to be a Speedy Strawberry, Passing Pear, Builders' Banana and Omnivorous Orange, but I got them mixed up and did not find time nor motivation to fix it).